With the 10 B multi-phase test connector, HARTING has developed the ideal measuring device for service technicians and engineers, as well as all personnel tasked with the installation, service and the maintenance of three-phase motors (230/240V AC, 50 Hz). The reliable operation of machinery and equipment is indispensable for production and servicing. Failures result in high costs and demand quick response. This is especially true during maintenance, when replacing defective equipment, and during the connection and installation of replacement components. Improper procedures, inadequate testing and defects during installation can irreversibly damage motors and result in manufacturing interruptions. 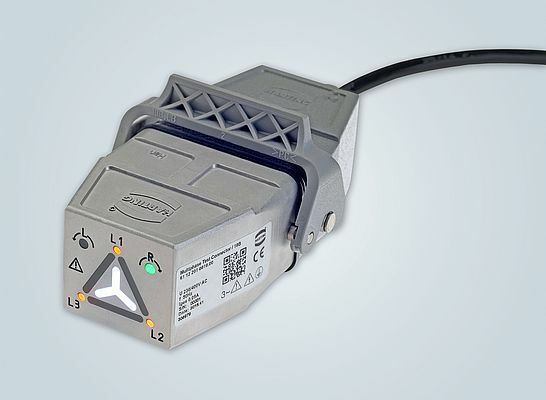 The 10 B multi-phase test connector was developed in conjunction with an automotive manufacturer and determines the connection of the phases (L1, L2, L3) on the AC motor power supply, as well as the interconnection at initial torque (star or delta connection) and the direction of rotation. These parameters are crucial for safe connection, swapping components, servicing, and for avoiding maintenance errors. The test connector meets DIN EN 61010-1, is quick and easy to handle, can minimise errors, reduce the number of work steps, eliminate failures and reduce costs. Design protection has been granted for the symbols on the housing. Europe VS Asia: Challenge or Opportunity?